the 100 years of Annual Reports: from cursive, to dot matrix, to digital. One of the responsibilities of the Indiana State Library is to provide support for the state’s 237 public libraries through its Extension Division. While Indiana celebrates its Bicentennial year, many of the state’s public libraries are also marking their centennial anniversaries. The early 1900’s were a busy time for the Public Library Commission, which initially consisted of three unpaid citizens appointed by the governor: Former State Librarian Jacob P. Dunn (Indianapolis), Mrs. Elizabeth C. Earl (Connersville), and William W. Parsons (Terre Haute). With a modest annual budget, the trio oversaw the following services that were crucial in the establishment of our state’s public library system. Advisory Visits – Commission staff had a goal of visiting each public library in the state per year. In 1915-1916, they made 228 visits, spanning from 1-2 hours to 1-2 days, most trips by train. During these visits, commission staff would review the library’s catalogue or shelf list, meet with trustees, and provide information on the methods, activities and experiences of other libraries in the state. Establishment Assistance – Upon learning that a town had interest in establishing a public library, Commission staff would visit the town, consulting with community members on the legal process of establishment and how to obtain grants from the Carnegie Corporation. Commission staff would also visit towns where there was no interest in establishing a library, but there was an evident need. Correspondence – Correspondence between the Commission office and libraries was done primarily via mail or telegram. The Indiana State Library maintains correspondence files for each public library, typically pre-dating the library’s establishment. Traveling Libraries – Sets of 40 books, including fiction, non-fiction, and juvenile books, were loaned to communities statewide. As of 1915, there were over 1,474 collections containing over 70,000 books which were available for lending at post offices, drug stores, YWCAs, banks, newspaper offices, and reading rooms. One was even located in a confectionary. Statistical Collection – The commission collected annual statistics of libraries, which included the librarian’s name, income, expenditures, and building and collection information. Consulting – Two library consultants continue to provide advice, guidance, and training for the staff and trustees of the state’s 237 public libraries on planning, policies, budgeting, and “all kinds of library problems.” Rental cars are the usual method of transportation. Correspondence – Most correspondence is now conducted via email and telephone, with consultants receiving approximately 200 questions per month each. The office also communicates with libraries via fax, mail, and quarterly mailings sent via courier. Statewide Digital Collections – The Digital Initiatives Librarian provides consulting and hosting for Indiana Memory, the statewide digital collection. Additionally, the division is overseeing the digitization of historic newspapers and the establishment of a statewide digital preservation program. Scanning equipment is available for loan. Resource Sharing – Rather than providing collections of books, the office facilitates resource sharing via the Indiana Share interlibrary loan service and INfoExpress courier system. In 2016, the Statewide Remote Circulation Service (SRCS) launched, which will further link the catalogs of 150+ public and academic libraries, opening their collections to patrons statewide. Grants and funding – Division staff help oversee the distribution of funding to libraries statewide, including LSTA grants, e-Rate, and reimbursements. Statistics – A consultant continues to administer the Annual Report for Indiana Public Libraries, a survey that collects Indiana public library data for state and national use. Public Library Standards – The Division is tasked with upholding the state’s public library standards, the goal of which is to ensure a minimal, equitable level of quality library service among the state’s 237 library systems. Standards include guidelines concerning staffing, expenditures, and technology access. As you can see, while 100 years have passed, not much has changed in the need for support for the state’s libraries, although technology and automobiles have certainly made our duties easier! What services and support do you think public libraries will need in 2116? 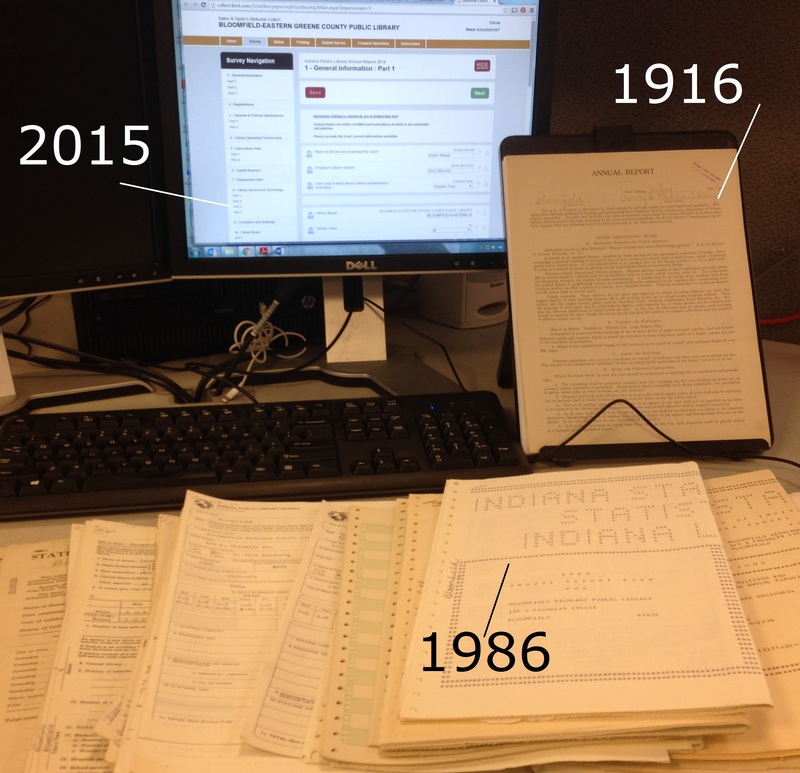 This entry was posted in Uncategorized and tagged 100 years of Annual Reports: from cursive, to digital.”, to dot matrix by indianastatelibrary. Bookmark the permalink. Very beneficial content. Thank for the posting.